Reliable, flexible and scalable Video walls to meet your display requirement. Ultra-bright, full-color, large format displays to connect & engage with your target audience. Control system that perfectly supports any type of video and data sources on any display configuration. Professional integration utilizing display and interactive technologies for a customized solution. A Spectacular display at Chimelong water park! 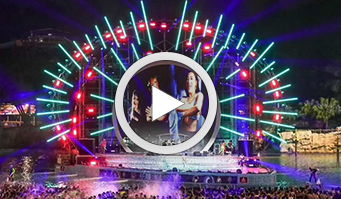 Delta's outdoor LED Displays 13m in diameter and 11.5m high used for Live stage shows.